Imam Sameh Asal of the Hoover Crescent Islamic Center speaks in solidarity with the Jewish community at a Feb. 24 rally in front of the Levite Jewish Community Center in Birmingham. 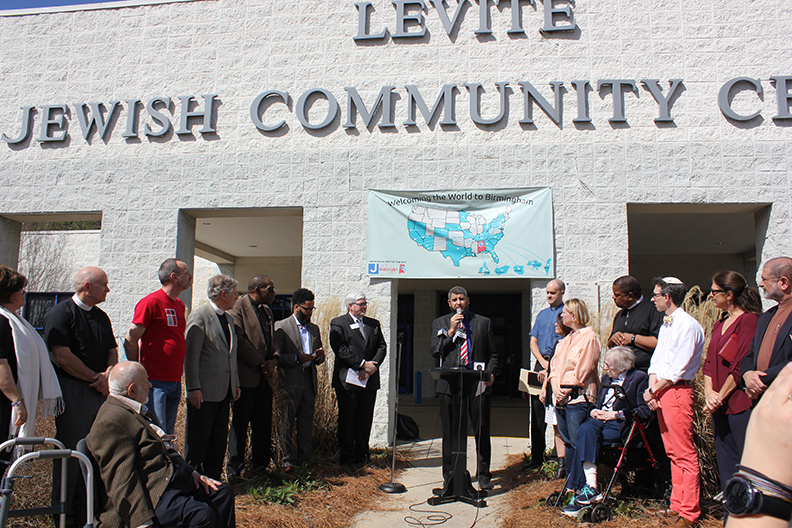 For the third time in six weeks, Birmingham’s Levite Jewish Community Center was evacuated after a bomb threat. The N.E. Miles Jewish Day School, housed on the LJCC campus, received a call around 8:05 a.m. today, shortly after the students began their morning prayers, and the emergency protocol was enacted. Law enforcement and K9 units responded and searched the building. The campus was declared clear just before 9:30 a.m., and regular activities resumed. The campus contains the LJCC, Birmingham Jewish Federation and Foundation, Cohn Early Childhood Learning Center and N.E. Miles Jewish Day School. Additional threats have been reported today in Asheville, N.C.; Davie, Fla.; Plantation, Fla; Ft. Lauderdale, Fla.; Harrisburg, Pa.; York, Pa.; Cherry Hill, N.J.; Owings Mill, Md. ; Wilmington, Del. ; Indianapolis, Ind. ; and Tarrytown, N.Y. The American Hebrew Academy in Greensboro, N.C., a pluralistic boarding high school, also received a threat. The Jewish Community Centers Association said as of late afternoon, there were 21 threats against 13 JCCs and eight Jewish Day Schools. As evening started, another wave of calls was reported along the west coast. This is the fifth wave of phoned-in threats since early January, where anywhere from 10 to 27 random JCCs receive threats on the same morning, with the caller claiming there is a bomb in the building. All have been hoaxes. The agency had similar threats on Jan. 18 and Feb. 20. On Feb. 23, the Uptown Jewish Community Center in New Orleans received its first bomb threat. JCCs in Nashville, Atlanta and Houston have also received threats during past waves. At a Congressional town hall meeting on Feb. 25, Rep. Gary Palmer was asked about the threats to JCCs, including the one in his home district, and he said it is a Federal issue. “I’m very concerned where this is headed,” he said. The latest threat came three days after a diverse crowd of about 300 people attended a quickly-organized moment of prayer and solidarity in front of the LJCC, organized by Faith In Action Alabama and the Greater Birmingham Ministries. Christian and Muslim clergy expressed solidarity with the Jewish community. The event was held on Feb. 24 at noon, and a similar event will be held in front of the Hoover Crescent Islamic Center, which has received emailed threats, on March 3 at noon. He said he has been briefed on the threats against the LJCC and has ordered the State Bureau of Investigation to coordinate with local and Federal authorities. “I can assure the people of our state that Alabama will not tolerate any threat, we will bring those responsible to justice and we will provide any resource necessary to protect every one of our citizens,” Bentley said. Betzy Lynch, executive director of the LJCC, said in an email to the membership that they refuse to accept that this is a "new normal." She added, "The outpouring of support that we have received from the broader Birmingham community has been astonishing. Thank you Birmingham for standing with us!" Debra Abolafia, head of the Day School, said "It has been an impossible 2 months for Jewish organizations, especially JCCs... we take each threat of violence seriously and execute our security procedures whenever necessary." There will be a Town Hall meeting on security at the LJCC on March 6 at 5:15 p.m. with law enforcement partners.